Rule #1 – Don’t Regret Your Decision. Rule # 2 – We can help. Oh Baby! It’s that thrilling time during an expectant mother’s pregnancy when she finally starts to think about the baby’s name. Remember, your baby is defenseless and unable to participate in this process, so keep that in mind when you permanently brand him or her with that final moniker, because it’s pretty much theirs for life (save a trip to the county courthouse in their adulthood). 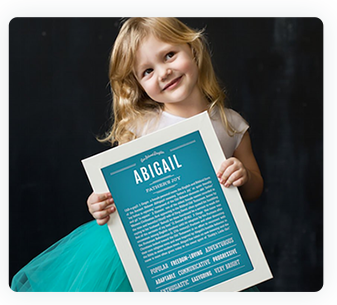 A child’s name is a reflection of his or her parents – a snapshot of your style, interests, values, ancestry, generation, education, peer group influences and/or position in society. This is the first critical step toward guiding your child’s identity. It’s the second most important gift you will give your baby (after giving him/her life). As with any vital decision, there are ways to minimize (if not altogether eliminate) the potential for making a mistake. Start with these five high-level approaches and, within that framework, you will need to consider all aspects of the potential opportunities and pitfalls of the naming process. Be very clear on your naming goal. Is your primary goal to be unique? Traditional? Is this your own selfish goal or are you really thinking about your child’s happiness? Do you want him/her to fit in or stand apart from his peers? 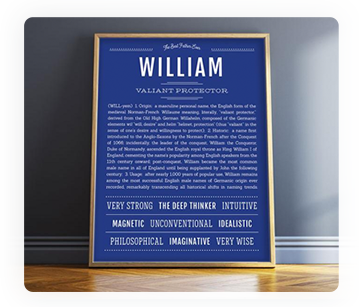 Do you want his/her name to honor a family member or be culturally significant to your ethnic heritage? Do you want your kid’s name to sound smart? To have a pleasant etymology? A strong one? A religious one? What exactly are you trying to accomplish with your baby’s name? Evaluate the importance of your naming goal. Let’s say your goal is to be unique. Really consider how important this goal is to you. Are you trying to “stand-out” and be cool for your own vain reasons, or do you really pride yourself on individualism. And, more importantly, will your child? Collect, organize and prioritize your options. Take your time to really research the names you like, pick names that are consistent with your goal, organize them and prioritize them. Then go ahead and throw in a couple of names that go outside your goal. Just for perspective. Assess your options against your goal. Your list of names and your positive response to them should validate your goal. You should have a strong sense of confidence, or else you may be on the wrong track. Trust your gut intuition. Choose the winning option. Be thoughtful. Be authentic to yourself. Don’t just think about yourself; think about your child. If you follow these steps carefully, chances are, you won’t make a mistake you’ll regret later. Studies have shown that when people are presented with too many options, there’s a greater chance of regretting one’s choice. Websites and books nowadays pride themselves on offering parents a ridiculous amount of names. Do you really want to peruse 30,000 names? In truth, nearly 75% of you will give your baby one of the Top 1000 names currently in circulation for each gender (that percentage is lower for girls and higher for boys, as parents tend to be more creative when naming their daughters). Another fact? 30-40% of parents bestow one of the Top 100 names onto their babies. Less than 20% of you will opt for one of the 30,000+ other names recorded each year by the Social Security Dept. This is why we only focus on the Top 2000 most commonly preferred and currently popular names, plus a smattering of more names not on the Top 2000 but ones which we find significant in other ways. Our smaller list also allows us to provide our visitors with a ton of in-depth detail and an accurate historical perspective on each name. You do not need to sort through 30,000 names, and if you do, we’re not here to help you. This has to do with the origin, source and historical ownership of an object. You often hear this word in connection to rare pieces of art (its provenance provides it with a large part of its value) – which is why we think it’s equally important to consider provenance for your own rare piece of art (i.e., your baby). We get the word provenance from the French “provenir” which means “to come from”. Where does the name come from? 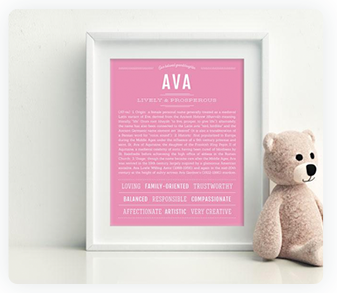 The importance of provenance is something we here at OhBabyNames value greatly. And we think you should, too. Another reason why we go overboard with our detailed research on each name. We start thinking about what we’ll name our children as young girls ourselves while “playing house.” Or perhaps we meet someone in our lifetime where the name resonates, or we love a character in a book we read, or a song we hear. Perhaps we admire some historical figure or we’re just ga-ga over some celebrity. Some of you will want your baby’s name to reflect a certain set of values (perhaps religious), and some of you will gravitate toward the ϋber-trendy or pop-culture influences (even if subconsciously). Some of you will want only a one syllable name, while others look for two or three depending on the tempo of the name when combined with your surname. Some parents prefer a name that starts with a specific letter of the alphabet and others are looking for a specific ethnic origin. Whatever it is, keep an open mind. Maintain the elements of a name you are sure are important to you, and then let yourself be surprised by new ideas. We find that many mothers hijack the baby naming decision-making-process away from the father, and many fathers (since they’re not the raging hormonal pregnant person) opt for the “pick-your-battles” philosophy and sheepishly take the back seat. But remember that your child is a part and a reflection of both of you. We advise parents to come up with lists separately and then compare notes. You may find out you think more alike than you expected. Or you may open yourself up to a new name you hadn’t considered. It’s important that the father and mother both feel good about the choice. The rhythm and flow of a name is important. The number of syllables and how it flows with the middle and last name. How does it sound when said with the siblings’ names? The length of the name and how many middle names you desire (historically speaking, American parents have typically bestowed only one middle name on their child, otherwise it seemed too pretentious, although this is not the case in European culture). How many vowels and consonants are contained in the name compared with the child’s middle and surname? Are there too many of the same vowels? How does it look when written out? Jennifer Jane Doe. Jennifer J. Doe. J.J. Doe. J. Jane Doe, etc. Calling Doctor So-and-So…Get to the ER stat! This is the age-old naming test. If you happen to be the patient in the ER who needs “stat” attention, do you want to hear “Calling Doctor Moon Unit Zappa” over the intercom? Yah, we didn’t think so. Also say to yourself, “Ladies and gentlemen, introducing the next President of the United States [Blank, Blank].” Go ahead. Dream big for your baby. But also give him/her a name that matches the stature of your aspirations. If you are truly hell-bent on some weird or unorthodox name, consider using it as your child’s middle name. Like Jennifer Love Hewitt’s mom did. She gave her daughter a socially-acceptable and trendy first name (trendy for 1979), and then celebrated her “Love” in the middle. It allows you to express your individuality without saddling your kid with constantly having to explain why his/her parents called him Pilot Inspektor or Moxie Crimefighter (unless you are leaving him/her a gigantic trust fund for his troubles). Artistic people (as in celebrities) have more leeway for two reasons: 1) their peer group is generally more accepting of the bizarre (whereas average society is not); and 2) they have a s***load of money, so who really cares, right? The rest of us chumps (and our kids) have to get real jobs. And generally speaking, people judge us by our names. Don’t pretend they don’t. Translation: “avoid tacky spellings”. Ok, so we put this naming rule in French in order to hide the fact that we’re probably offending a lot of people out there. The truth of the matter is that American parents just LOVE “yoo-neek” spellings of otherwise traditional names. And the Top 2000 list is peppered with them. However, many (perhaps most?) people find heavily altered spellings rather low-brow and kitschy. Even undereducated. But here’s why we don’t like them: 1) It creates confusion. How would you like to be the preschool teacher with four Kaylees in your class, only they’re spelled Kayleigh, Kailey, Kaylie and Caylee. 2) The child will be nuisanced with having to correct people their whole life. How would you like to repeat “My name is Caden. That’s spelled K-A-E-D-E-N.” about 1,268,751 times? And 3) Really, what’s the point if they are all pronounced exactly the same way? Hailey, Haley, Haylee, Hayley, Halle, Hailee, Halie, Haleigh, Haylie, Hayleigh. How original can you be? Seriously. Stop the madness. Sigmund Freud had it exactly right when he said, “A human being’s name is a principal component of his person, perhaps a piece of his soul.” Don’t be silly, flippant or stupidly carefree. You love your child so say it with the name. Consider all associations: the name’s history, etymology, cultural significance, ethnic and religious substance, nickname options, likelihood of schoolyard teasing, mainstream vs. unconventional choices, how is the name trending? Is our current generation tiring of it or are you ahead of the trend? Do you want the name to stand out or blend in? Is the numerology favorable in terms of desired personality? We love this quote by Madonna: “I sometimes think I was born to live up to my name. How could I be anything else but what I am having been named Madonna? I would either have ended up a nun or this.” And finally, and perhaps most importantly, have two or three names ready for each gender. Because when that little angel enters the world, he/she may surprise you. One name might intuitively work and another may be all wrong.